A big part of what enterprise architects do is creating visual models. This is also known as EA modeling. We use EA modeling to deliver certain insights. The visual model is often how this insight is delivered. We will now discuss two aspect of this. First we will share what the most common EA models are. Secondly we will discuss some basic tips & hints on basic modeling techniques and styles. Now often creating visual models is done using EA tools. So when you are looking at the remainder of this article consider this almost a set of functional requirements for EA tools like EAComposer. With TOGAF 9.1 a strong focus on Capability Based Planning was introduced. From this, as you might have guessed, a business capability model for your organization is a very common visual model. A capability model show “what” your organization does. This “what” is usually very stable over time and therefor an ideal structure to share insights against. In TOGAF lingo this model is actually called a Functional Decomposition artifact. Consider it a cornerstone. 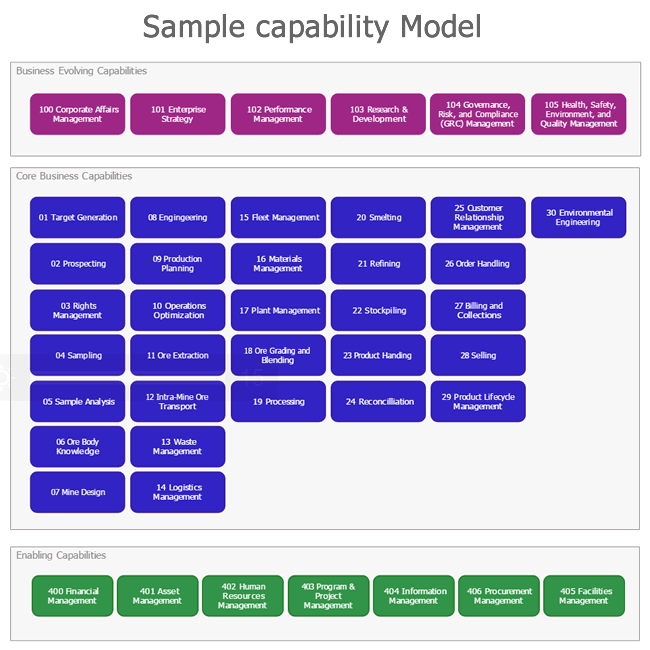 The business capability model resides in the business architecture domain. Other models in this domain include process models (the “how”) and organizational models (the “who”). A second popular model is inside the Application Architecture domain. Most often the related visual model is a model that shows applications and their relationship to capabilities (see above) that they enable. So you would visual map showing capabilities and the applications that are supporting/enabling these capabilities. A second benefits coming from developing this view is that you often also end up with an initial Application Inventory or in TOGAF lingo an Application Catalog. Second we will share some tips & hints on modeling techniques. - Make sure you can re-use your models. Creating good visual models take time. So once you have a good model that you like and resonates with your business stakeholders make sure you can easily re-use it. - Apply a consistent flow in your models. Most common the flow is either top-down or left-to-right. - Setup standards for the symbols to be used across your models. E.g. an application shape should always look visually the same so it is easy for people to read your models. - Include legends. Remember most other people reading your models won’t have the same background & knowledge so simply include a legend explaining symbols and shapes. As you see from the above there are several functional requirements for an EA tool embedded. The tool should make it easier for you across all those items e.g. manage visual standards for models, create logical data models, re-use models.